Quiche with all sorts of filling is always a hit. This quiche is made with ham, spinach and mushrooms - which can easily be swapped out for other veggies, if the family demands it. 1. Preheat your oven to 200 degrees convection. Place the dough in a buttered or oiled quiche tin - all the way up the sides. Poke the bottom with a fork, to keep it from bubbling up. ?bake the quiche crust for 10 minutes and remove. 2. Mix egg, milk, cottage cheese, grated cheese and salt in a bowl. 3. Wash the mushrooms and thoroughly rinse the spinach. Slice the mushrooms and cook with some olive oil on a pan for a few minutes, until slightly brown. Add the spinach, season with salt and pepper and continue to cook until they've wilted down somewhat. 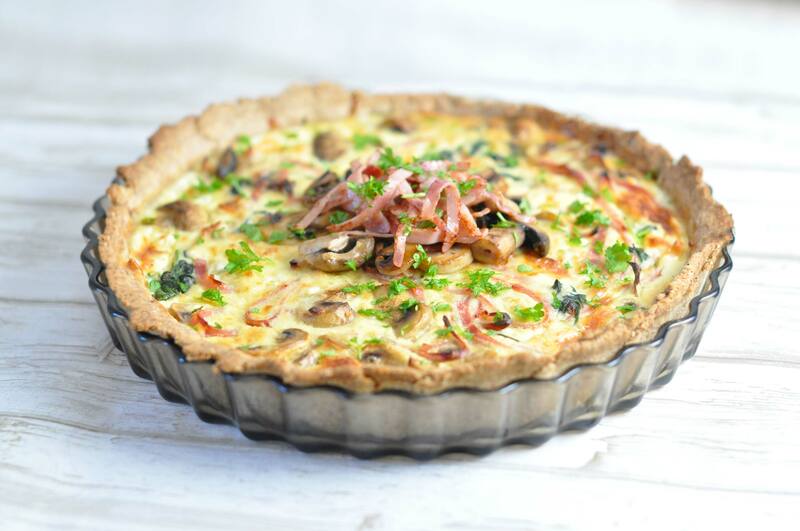 Drain the veggies, stir into the egg mix along with the ham cut into strips and spread everything evenly onto the quiche crust. 4. Bake the quiche at 200 degrees convection for 20-25 minutes - or until the egg mass has solidified and the quiche has a beautiful, golden surface. Garnish with some extra roast ham and mushrooms. You can absolutely buy grated cheese at the supermarket, but it's much cheaper to buy a solid piece of cheese and grate it at home, cut into cheese sticks for the kids' lunch, and cut a few slices off for a nice afternoon toastie. And that keeps those nasty E-numbers off your dinnertable!